Federal funding for street redesigns on Masonic Avenue, Second Street, and other improvements was unanimously approved yesterday by the Board of Supervisors, acting as the board of the SF County Transportation Authority. The projects selected to receive a chunk of the regional One Bay Area grant also include a bike/ped path on Mansell Street in McLaren Park, pedestrian safety improvements on Broadway in Chinatown, and bike and pedestrian upgrades on streets around the Transbay Transit Center. Altogether, $35 million in OBAG funds will go toward projects in SF. The most anticipated project in the package — and the most contentious — was the overhaul of Masonic, a deadly street which is slated to get raised bike lanes, reduced traffic lanes, a tree-lined median, bus bulb-outs, and other pedestrian safety upgrades. Of the estimated $18 million needed for the project, OBAG will provide $10 million, while the SFMTA is expected to provide the remaining $8 million. This is a huge win for safer, more complete San Francisco streets — especially on Masonic Avenue, one of San Francisco’s most deadly streets. 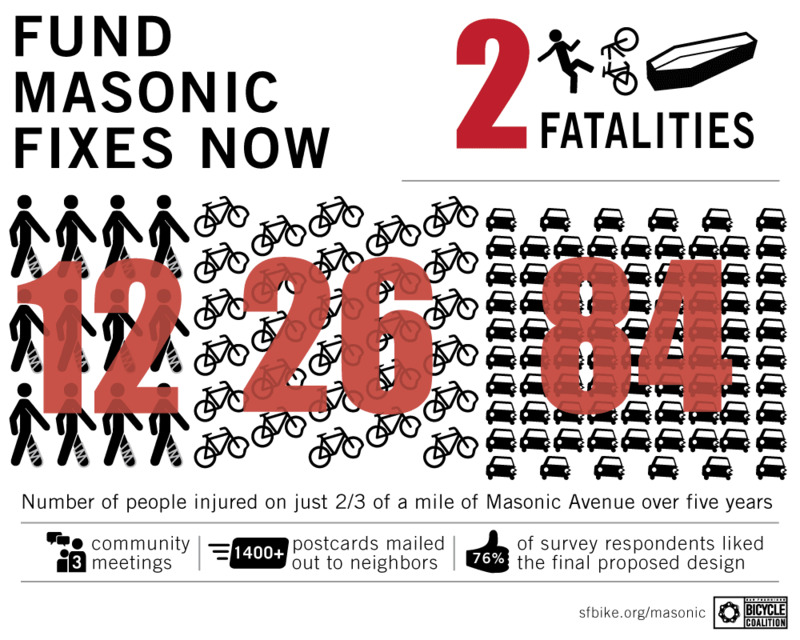 In the last five years, 122 people have been injured and two people killed, just on 2/3 of a mile of Masonic. Thanks to today’s funding decision, this deadly corridor will be transformed into a safer place for all road users. Even though the Masonic project was approved last September after several years of planning and extensive outreach, a few dozen residents at the hearing told the board to reject funding for the plan because it would remove all on-street car parking on Masonic. They claimed that the safety upgrades were actually dangerous, would add congestion, and that they weren’t notified about the planning process. Almost as many speakers who backed the project attested to the long-overdue need to save lives and make the street more accessible to bicycling. Supervisors — including Eric Mar, Mark Farrell, and London Breed, who penned a joint letter in February urging funding for the project — gave a sympathetic nod to the complainers, but didn’t budge on their commitment to safer streets. The SFCTA’s package of projects selected for OBAG funding is expected to be approved by the Metropolitan Transportation Commission as part of the broader regional program. This is excellent news. I regularly take the 43 and drive on Masonic with my daughter, but avoid bicycling because there isn’t a safe route near that corridor. And to those who say “Just take Baker” I challenge you to attempt to reach Trader Joe’s or the JCC with a trailer bike using the maze that “Fix Masonic” seems to think is perfectly adequate. There is no reason why people who ride bicycles can’t use the same easy and direct route that cars and buses now enjoy. However, just because they have funding doesn’t mean this project will get done in any reasonable amount of time. After all the foot dragging that went on with the changes on Oak and Fell, which required much less effort, it’s anyone’s guess when they will get around to this work. I think you meant “the maze that ‘Save Masonic’ seems to think is perfectly adequate.” And I agree – that route was/is a joke given how much more hilly it is, the number of turns it entails, and how indirect it is. I think you’re confusing “Fix Masonic” with “Save Masonic”. All the “Save” groups are in opposition of something (e.g. Save Polk, Save Muni, etc.). All the “Fix” groups are for something. Fantastic. The more cycle tracks go in, the more people (regular people who are fearful of riding on SF streets now) see good bike infra in action, the more support we’ll have for projects like the 2nd Street improvements. 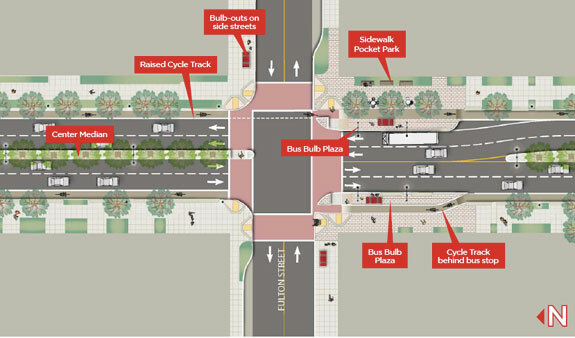 Note to Planners: Please make all cycle tracks a nice beige in your renderings, as opposed to the neon green that makes it look like all street improvement projects are about is bike lanes! 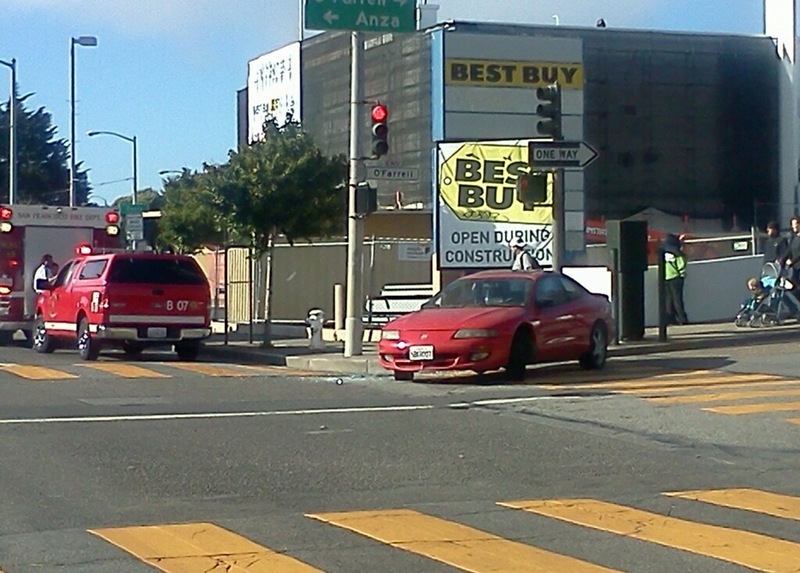 Did the car in that photo get spun around in the crash, or was someone driving the wrong direction down O’Farrell? Mario & biking in SF – yes, you’re absolutely right – I mean ‘Save Masonic’ not ‘Fix Masonic’. Got the groups mixed up. Thank you. Will the bus bulb cause a right hook problem for bikers traveling northbound on Masonic? Would it be better to have the bus bulb on the far side of the street as shown for the southbound direction? Northbound is uphill, so bikes should be going pretty slow, at least. The bike lanes on Baker work fine. The maze over the hill through that residential neighborhood would not work. There are bike lanes on Turk so couldn’t you accomplish the connection by just adding bike lanes between Turk and Geary? As an avid biker, I am all for more bike lanes but I think this plan is going to create some serious problems. Where is all that traffic going to go to? How about all the cars sitting idling on that street? Taking down the central freeway has definitely had its benefits but Oak/Octavia and Franklin/Gough are parking lots in rush hour and make that neighborhood less than ideal during those times.